Kevin Schmidt (Canadian, b. 1972) has become well known for his laboriously produced yet subtle time-based projects. 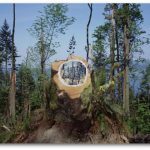 In works such as Long Beach Led Zep (2002) and Wild Signals (2007) Schmidt cues the viewer towards a particularly familiar idea of landscape while gradually casting the scene with an obviously fabricated approximation of the sublime. 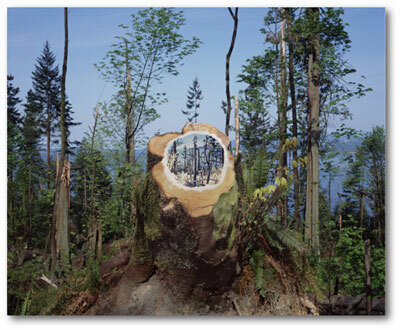 Commissioned by Presentation House Gallery with the assistance of the Vancouver Parks Board and the Catriona Jeffries Gallery, this unique photograph was shot in Vancouver's Stanley Park, and depicts a painting on the cut stump of a tree felled during the destructive windstorm in the late fall of 2006. Schmidt eulogizes what has recently been lost while taking advantage of the new prospect afforded by the storm.